Pulav is once a week fare at my place as it is easy to make and yummy to eat and also is good for lunch boxes or as a nice one pot meal for a weekend lunch.I make various kind of pulavs which I directly make in pressure cooker or rice cooker by sauteing all the masalas and rice and pressure cook together,but this pulav is bit different as the rice is prepared separately and is mixed with a masala paste which helps in retaining the fresh aroma of mint leaves and also eye-catching color.Mint is one of the most flavorful herbs and is must while making biriyanis to get that special flavor and I assure you that this pulav is truly flavorful as it is loaded with mint flavor.I like to add soya chunks to pulavs as they absorb the strong flavors of pulav and it is a pleasure to bite into those chewy flavorful soya chunks in pulavs.However if you don't prefer adding soya chunks to pulav you can go ahead with roasted baby potatoes or blanched mixed vegetables or paneer cubes instead of soya chunks and is completely your choice. Wash and soak basmati rice in water for 10-15 mins and cook it until done.You can cook it in either pressure cooker with the proportion 1c-rice:1 3/4c-water or in the rice cooker 1c rice: 2c water. Spread it over a plate and add a tsp of ghee all over it after spreading it,it will keep the rice granules separate.Let the rice cool completely. Pressure cook soya nuggets(or potatoes) for 2 whistles or cook it on stove top.I made rice and soya nuggets in different compartments in cooker. If you are using potatoes peel them and cut into cubes,if you are using baby potatoes remove the skin and prick them using fork.If you are using soya nuggets after cooking them squeeze out the water from it and keep them aside. Clean and wash the mint leaves and let them drain excess water. Heat a tsp of oil and add mint leaves and saute it for a minute until they wilt.Add green chillies,ginger and grated coconut and slightly warm it and let it cool completely.Grind it into a paste by adding half of the lemon juice and open the lid and keep it separately.Adding lemon juice will help in discoloration and also keep it open. Heat oil and ghee in a thick bottom kadai and add cloves,cardamom,cinnamon and bay leaf and add chopped cashews and fry until light brown in color. Add sliced onions and fry well until they bit dark brown in color and add fresh/frozen peas to it and fry well. If you are using potatoes add them now and let them roast a bit until you get brown patches on it.If you are using soya nuggets no need to fry them much,just add them. Add ground paste and fry well until the raw smell goes away.This takes a couple of minutes. Add cooked and cooled rice,salt and lemon juice and mix carefully until everything is well mixed and the rice is warm. Serve it hot with cucumber-onion raitha and papad. I have used small soya nuggets in the recipe,it is your wish to add soya nuggets or potatoes in the recipe. If you add lemon juice while grinding the mint leaves it will help in retaining its color. You can even pressure cook the masala along with rice but I like the freshness and flavor retained by mint when sauteed separately and mixed with rice. As the mint has strong flavor in taste,the bland tasting soya nuggets soak all the flavors from the mint masala and makes it extra flavorful chewy bites in pulav,so I recommend to use soya nuggets in this recipe. 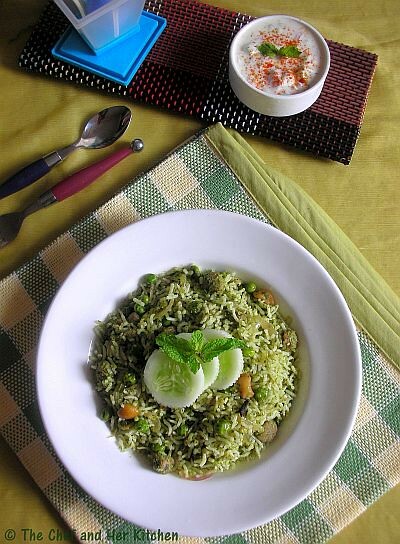 this looks so delicious..I do make mint puloa..but should try adding soya chunks next time..sounds so good..
Love the refreshing minty taste of this pulao ~ all your pics are stunning! Mint pulav is superb and the pics are really good.I too like mint pulav but never prepared till now.Will dfntly try one day. Mint pulav with soya nuggets,wow,sounds nice and love the gren colour you have got,looks so fresh!love the set up! Oh my ! Who can resist that perfect bowl of rice ? I adore mint flavour.Awesome clicks as usual Prathibha ! Mint rice looks yummy and tempting. Awesome Clicks and presentation. I make almost the same way except I add paneer/tofu cubes like u said- yum platter ! Yummy and flavorful. Love the aroma of mint .. I agree, pulaos are so easy to put together on weekdays. looks colorful and yummy. You're making me hungry with these yummy & flavorful rice, very refreshing & tempting pics! its lunch time n these clicks r making me more hungry for this yummy rice.. Presentation itself looks soo tempting..really delicious recipe!! 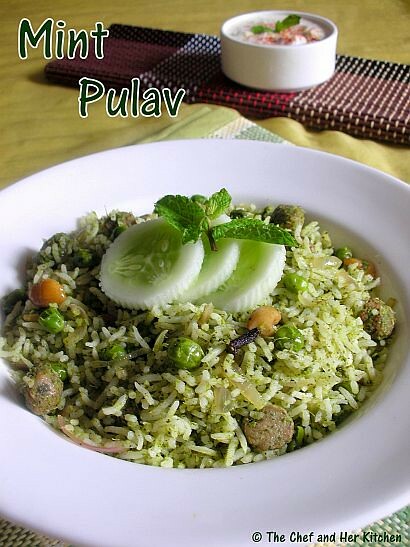 I can feel the flavour of this pulav,love the recipe...luks delicious. Lovely looking one. Nice recipe. Awesome bowl of fragrant green rice... YUM! 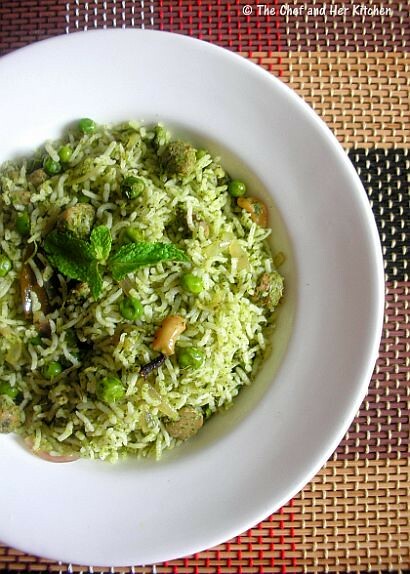 Delilicious mint pulav, perfect meal. My sister in law just bought back a bunch of mints and this recipe is so timely! Thanks for the lovely idea! Hey Pratibha, this is exactly how I make mint pulao and I like both potatoes as well as soya nuggets! This looks scrumptious! So delicious and tempting...am loving the colour of your pulao..
Oh wow! superb..I can almost get the aroma here just by looking at the pics! I too have one waiting in my draft..will post it soon! 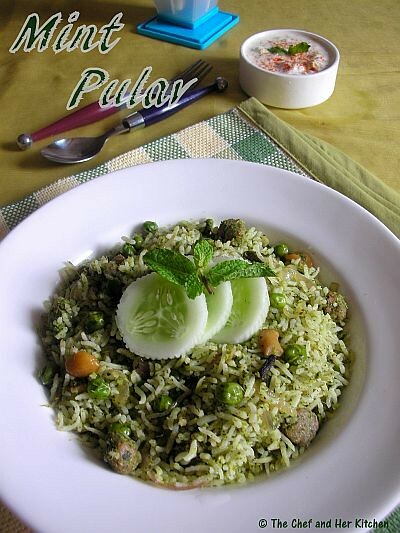 The pulav looks so yummy ... jus love the simple clean styling n beautiful click too !! 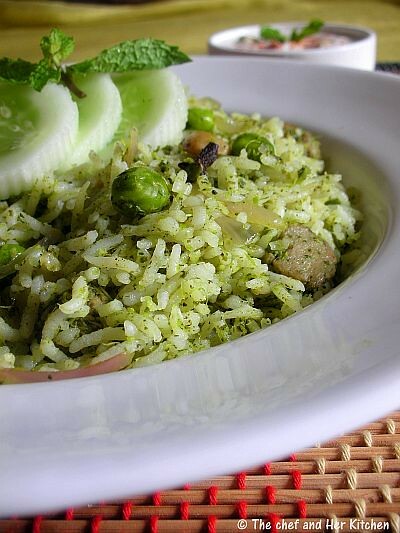 Flavorful and yummy pulao...looks delicious. Looks delicious ! I can smell the mint too ! Awesome clicks Prathy! Just wanted to ask which brand of basmati rice you buy here. We moved back to Bangalore recently & I am in search of good quality basmati rice. You rice is perfect! My recipe for mint rice is very similar but i add other veggies too. You are so right abt adding soy chunks to pulaos - flavorful and tasty. This looks awesome and cool for summer! I love the fact that you have included nuggets! wow wht a refreshing pulav.. love mint in anything!! Looks colorful and Refreshing Prathibha!! Recently We have moved to Bangalore, and might reside in Whitefield Area. My favorite kind of Pulav. I have lots of mint in my refrigerator and I am going to try your recipe. 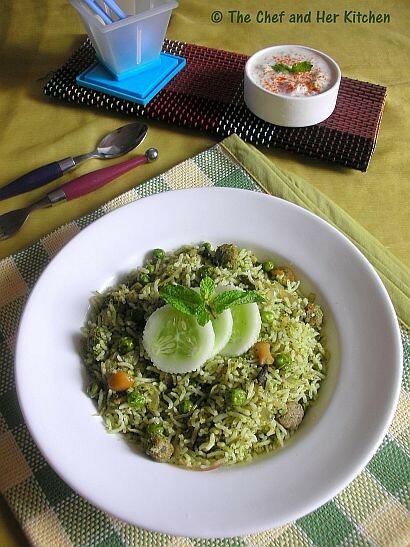 Your styling and pictures make this simple rice dish look absolutely divine. Adding potato and soy chunks sounds too delicious, gotta try this variation! Made this for lunch today....absolutely delicious....one of the best pulaos i have made....thanks to you...loved the flavour,texture,everything.....thank you. Today was a special day.. tried 3 of your recepies and all turned very good... Thanks for making this day more special.